Hi! It’s Black Friday today. For the next several days people will go shopping and buying holiday gifts for the holidays. Experts think Black Friday will be a good day for department stores. The latest Deloitte survey shows that 70 percent of respondents plan to shop in-stores this year. However, nearly 8 in 10 (79 percent) of respondents say they’ll shop on Black Friday, either in-store or online, the survey also said. Another study by App Annie suggests that this year, total time spent in shopping apps on Android phones grows over 45% during the Black Friday week. The experts predict that Black Friday 2017 set to be biggest mobile shopping day ever. This means retailers should be ready to catch up the customers across all the channels, and omnichannel strategy сan help them do that. How? Read the expert’s opinions. Nick McLean, the CEO of OrderDynamics, breaks down an OrderDynamics’s study, where the company tracked the progress of different retailers focusing on their services’ efficiency. One of the main omnichannel capabilities is click-and-collect, or buy online, pick up in-store (BOPIS). Yet, only 37 percent of retailers offer click-and-collect services. Without the ability to offer this flexible fulfillment service — and offer it fast — retailers face the reality of losing customers to competitors who provide this service fast. Retailers need to know whether they can offer click-and-collect services on items and provide accurate timelines for pickup. More than 30 percent of retailers that fail to offer accurate, real-time inventory visibility for all parties are limiting the impact and functionality of most other parts of their business. Returns simplicity matters, too. The research also found that more than 40 percent of multichannel retailers don’t allow customers the chance to return online orders in-store. This is one of the reasons why many consumers don’t buy certain items online (e.g., apparel). In-store returns can be a true revenue generator based on the fact that they stimulate more online sales. Beyond that, they also bring customers to stores, rising the chances of making an upsell or resale. The customers are the center of the omnichannel system. They decide where and how to go shopping. That’s why retailers have to look for the customer desires and habits to build the strong system, that allow to sell more and to keep up with the industry. Just download it by link above and enjoy reading. Unspun is a tech-led fashion brand that uses 3D imaging technology and proprietary fit algorithms to create products that fit perfectly. The brand specializes in jeans and denim clothes. 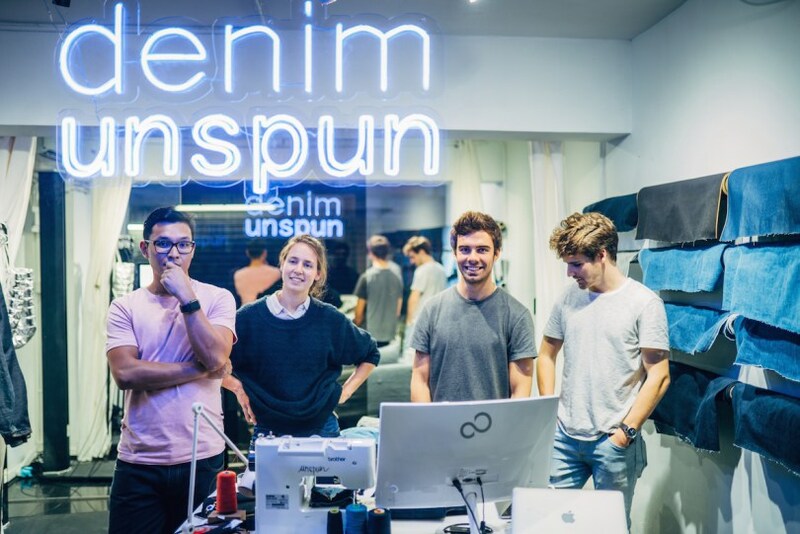 Unspun opens pop-up stores to interact with customers, letting them use a 3D body scan technology to tailor their own models of jeans and explore the products together with one of the co-founders. Unspun used the pop-up as a pilot tool to test the market before scaling up. The fashion startup is at the beginning of their journey to deliver a novel experience to their customers. Calvin Klein Inc. and Amazon Fashion on Thursday announced the Calvin Klein X Amazon Fashion holiday retail experience, available now through Dec. 31. Customization stations where shoppers can personalize Calvin Klein underwear purchases with embroidery. Brands need to do a better job of forecasting demand across both of offline and online channel to meet expectations of customers, according to a report from Oracle called “Retail in 4D”. Here is the next portion of data from The 2017 Retail Technology Report. This time the executive editor of Total Retail Joe Keenan shows us how companies buy and implement new retail technologies. 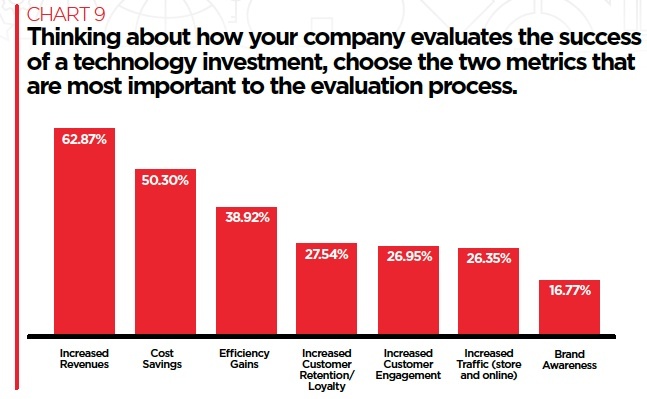 As expected, the increase in revenue (62.87 percent) and cost savings (50.30 percent) are the top two metrics respondents believe are most important when evaluating the success of a technology investment. 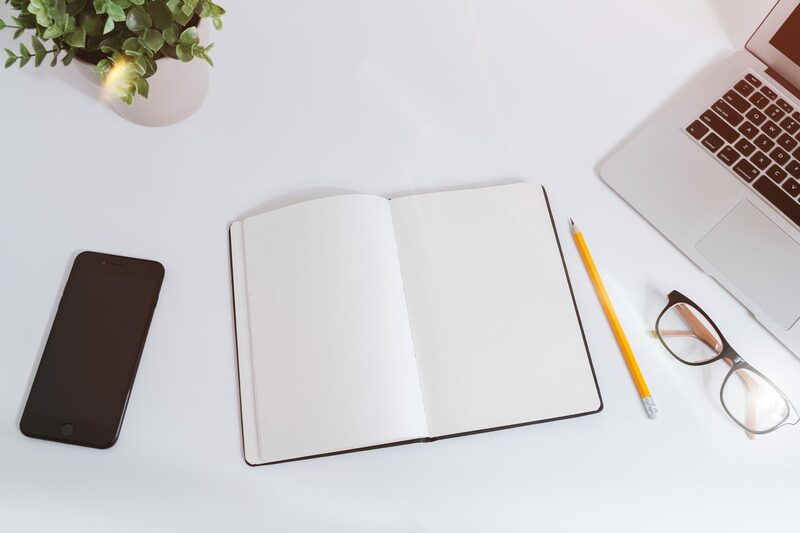 Efficiency gains were the third most-cited metric (38.92 percent), followed by increased customer engagement (26.95 percent), increased customer retention/loyalty (27.54 percent), increased traffic (26.35 percent), and brand awareness (16.77 percent). Do I understand what improvement this investment will result in and/or the problems it will solve? Have I thoroughly considered the staffing changes that this investment might enable or require? Do I have the necessary buy-in from the C-suite that will result in a successful implementation? Have I identified any required training and ensured that we have the resources and time to provide it? In episode 119 of Total Retail Talks, Rob Royer, founder and CEO of Interior Define, discusses how the custom furniture retailer is using technology to help bridge the gap between online and offline shopping experiences. Listen to the podcast by the link above. Pinterest launched its first-ever Secret Santa, a personalized gift tool that allows users to find custom gift ideas for friends and family. Brand partners for the tool include Amazon, Bed Bath & Beyond, Coca-Cola, CVS and Universal Pictures. The tool uses the Pinterest API to create custom idea boards based on what friends and family are saying on the social media platform. To find gifts for people who aren’t on Pinterest, users can find a persona, such as travelers or pet lovers, similar to the person they are shopping for. This holiday season, shoppers could be confronted with a great deal of technology in stores — both on sales floors and behind the scenes — than previous holiday seasons as retailers continue to test a variety of different solutions. Some of these technologies, such as “magic mirrors” set up to help customers in smart dressing rooms, are more flash than substance, according to Mulpuru. But embedded technology such as RFID tags proves to be useful. Meanwhile, retail is rapidly moving toward the future where more product and brand advertising in stores, so that retailers can better leverage foot traffic to grow revenue in new ways — from marketing and advertising programs. Here is a traditional bonus we share at the end of the digest. Total Retail’s journalists wanted to understand how customer buying and ordering the products, what influence on their choice and what brand provide with the best experience. They’ve come through 50 customer journeys with global brands. Read the article to know what conclusions journalists have come to. That’s all for this week. See you in the next digest!